Carla Bruni-Sarkozy is not the typical first lady, who can be seen next to the president of such a conservative country like France. She has repeatedly been accused of breach of official protocol events. She even affords to openly criticize the Pope. Bruni walks the distance from the catwalk to the Elysee Palace, form the first man of the rock music – Mick Jagger to the first man in the country – Nicolas Sarkozy. Carla Bruni was born on December 23, 1968 in Turin, Italy. Comes from a wealthy family that owns a company for production of tires. When she was 5 she moved with her parents to France, due to threats of kidnapping. Carla grew up in Paris and later on graduated a school in Switzerland. At the age of 19, she returned to Paris and no longer after she started a career of a model. Carla Bruni entered the world of fashion and quickly became one of the 20 most expensive top models, earning $ 7.5 million per year. She worked for the most famous designers and fashion houses, including Givenchy, Dior, Paco Rabanne, Sonia Rykiel, Chanel, Versace and many others. Bruni quickly became a darling of the tabloids, thanks to her relationships with famous men like Mick Jagger and Eric Clapton, Donald Trump, Kevin Costner and Vincent Perez. She became famous with the words that that she is easily bored by monogamy, and that “love lasts a long time, but the burning attraction between men and women – just a week or two. On February 2, 2008 Carla Bruni again called the attention to her personality and becomes a media sensation. The occasion is her wedding with the French President Nicolas Sarkozy. Reviews were contradictory and varied from strong approval of the new first lady to absolutely negative. There were many vicious comments like “The Third Mrs. Sarkozy”… Despite her new duties, Carla didn’t sop singing. On the contrary – just a few months after becoming a first lady of France, she promoted her new album. The funds available from its sales were given to various charities and humanitarian causes. In July 2009 Carla Bruni was invited to sing during the 91st birthday of Nelson Mandela. As the first lady of France, Kalra Bruni-Sarkozy is always observed with a magnifying glass. For example, during her visit to Britain, she was admired on her choice to be dressed in a suit from Christian Dior. The reason? This is a French brand, leaded by a Britain’s chief: the designer John Galliano. 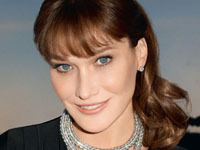 Carla Bruni-Sarkozy has always demonstrated personal position and did not hesitate to criticize even Pope Benedict XVI in connection with his position on AIDS.